viii, 51 p. : ill., maps ; 28 cm. Includes bibliographical references (p. 46-51). Incorporated spent answering questions on the magnesium extraction process. at the Florida Geological Survey. 12,200 (Smith and Bayya, 1989). erenced under the applicable sections in the text. was produced by Chaki and Oglesby (1972). Figure 1. Gulf County location map. surface map of the Florida panhandle. number unique to the well. Figure 3. Well and locality numbering system. by poorly- drained pine flatwoods and swamps. between Gulf and Franklin Counties. tions of high-standing Pleistocene Epoch seas. plain of the Apalachicola River. floodplain of the Apalachicola River. Table 1. Wells and cores referenced in text and cross sections. Figure 4. Marine terrace elevation zones of Gulf County. : *- ., : ;_ .. _- > - _ . 060 A MnY 1060 irtl 9(60 99(0 V.-4-. Figure 5. Portion of the Overstreet topographic quadrangle map showing relict beach ridges northeast of Port St. Joe. shape of the spit have occurred in historic times. underwent about 33 feet per year of retreat. range in age from Paleozoic to Holocene. Figure 6. Sand dunes on St. Joseph Spit (photo by Ken Campbell). .1 QUATERNARY PLIST OCENE DIFFERENTIATED SAND AND CLAY UFOSSILIFEROUS QUARTZ SANDS CLAYEY SANDS, AND SANDY CLAYS. JACKSON BLUFF FORMATION SHELL BEDS, FOSSILIFEROUS CLAYEY SANDS, AND SANDY CLAYS. COMMONLY CONTAINING MOLLUSKS, FORAMINIFERA, AND ECHINOIDS. O MIOCENE MIDDLE GLAUCONITIC, AND PHOSPHATIC FOSSILIFEROUS LIMESTONE. N. O CONTAINING FORAMINIFERA, ECHINOIDS, BRYOZOANS, AND MOLLUSKS. 25.2 w TERTIARY ____B OUS UMESTONE AND DOLOMITE OR MOLDIC, RECRYSTALLIZED DOLOMITE. FOSSILIFEROUS DOLOMITE OR DOLOMITIC LIMESTONE. 394. Cu G FOSSILIFEROUS LIMESTONE AND DOLOMITE. 49.0-C ARGILLACEOUS LIMESTONE AND DOLOMITE AND CALCAREOUS SALES. LCOX GROUP UNDIFFERENOCCASIONALLY GLAUCONITIC LIMESTONE. UPPER v ACAREOUS SALES CONTAINING FORAMINIFERA AND INOCERAMUS PRISMS. LOWER UNNAMED SANDSTONE AND SHALE RED TO REDDISH-BROWN QUARTZ SANDSTONES AND SHALES. O UPPER _____ ANVILL MAIN THIN-BEDDED LIMESTONES. 1, LIMESTONES, OFTEN CONTAINING CONGLOMERATIC IGNEOUS MATERIAL. 1 U MIDDLE LOUANN SALT VERY PURE TO ANHYDRITIC SALT. Figure 7. Generalized stratigraphic section in Gulf County (modified from Braunstein et al., 1988). SMACKOVER FM. AYNEggS5LE FORMA ? CAMBRIAN UNNAMED O LO .. Figure 8. Paleozoic and Mesozoic geologic cross section in Gulf County. deposits exposed at the surface. considered part of the North American craton. granodiorite (Applegate et al., 1978). Formation overlies the quartzite in this well. Figure 9. Cenozoic geologic cross section location map. Figure 10. Geologic cross section A-A'. Figure 11. Geologic cross section B-B'. Figure 12. Geologic cross section C-C'. Figure 13. Geologic cross section D-D'. Figure 14. Geologic cross section E-E'. Figure 15. Geologic cross section F-F'. bottoming in Paleozoic rocks or Jurassic salt. Formation section in Gulf County (see Figure 8). Production Company No. 6 St. Joe Paper Co.
ous, micritic limestone (Applegate et al., 1978). feet MSL, with a gentle southwest dip. color (Applegate et al., 1978). conitic sands and shales (Applegate et al., 1978). County ranges from about 400 to 800 feet. Bulimina carseyi, and Bolivinoides decorate. lying, at approximately -2,800 to -3,200 feet MSL. are predominantly impure marine carbonates. (Miller, 1986) of northern and peninsular Florida. acteristic of both eastern and western facies. limestones (FGS well file data). has been used by the Florida Geological Survey. in this area is derived from oil test well samples. ranges from about -950 feet to -1,015 feet MSL. wells, ranging between -700 and 750 feet MSL. ered the carbonates of earlier epochs. quartz sand, clay and occasionally phosphate. the area of the Apalachicola Embayment. tus by Puri and Vernon (1964). Downdip in the vicinity of Gulf County, the St.
entiate, even in cores. For this reason, the St.
the geologic cross-sections (Figures 10 15). feet in the southwestern part of the county. Figure 16. Structural contour map of the top of the Bruce Creek Limestone. Figure 17. Structural contour map of the top of the Intracoastal Formation. apparent in the lithology (Bolling, 1982). Schmidt (1984) included these "Chipola-like"
Miocene in age (Akers, 1972; Huddlestun, 1976). referred to as "Chipola-like" sediments. from 0 to about 50 feet. county, dipping and thickening to the southwest. Figure 18. Structural contour map of the top of the Jackson Bluff Formation. southwestern portions of the county. nomenclatural history for this feature. southwestward-plunging axis of the embayment. Figure 19. Principal subsurface structures of north Florida. Cenozoic in age (Schmidt, 1984). trough was an area of non-to-slow deposition. entire Paleocene through Eocene time. lated from continental terriginous sediment input. around its crest in Citrus and Levy Counties. zone of saturation is known as the water table. the aquifer nomenclature in use today. fined and the water level is free to rise and fall. cial and intermediate aquifer systems. The. for public water supplies in Gulf County. thickness and lithology of the host formations. age from the overlying and underlying aquifers. used as a potable water source in Gulf County. and the Bruce Creek Limestone. chalk which act as confining layers. the aquifer are exposed at the surface. Figure 21. Potentiometric surface map of the Floridan aquifer system in Gulf County (from Barr, 1987). ly being lower adjacent to pumping wells. system is currently good for all of Gulf County. ties and petroleum resources of Gulf County. sent Pliocene and Pleistocene deltaic deposits. making in neighboring Calhoun County. (Florida Geological Survey unpublished data). sandy, short working, no drying defects. and is not a local commodity. nental shelf deposits (Arthur et al., 1986). will depend primarily on local demand. ern tip of Cape San Bias. samples from both the western edge of St.
high wave energy, such as storm surges. epidote, sillimanite, and amphibole hornblendee). Apalachicola River (Arthur et al., 1986). Basic, Incorporated (P.O. Box 160, Port St. Merchant, Basic, Inc., personal communication). materials, and in refractory processes. been drilled in Gulf County (see Figure 22). tive Tuscaloosa trend of southwestern Alabama. depth, and all were dry holes. 0 1 2 3 4 5 FGS ACCESSION NO. Figure 22. Map showing locations of oil test wells in Gulf County. meabilities and porosity (Applegate et al., 1978). well was plugged and abandoned in 1974.
may be an area of increased exploration activity. Florida and the Atlantic coastal plain: Tulane Studies in Geology and Paleontology, v. 9, p. 1-139. Section, Society of Economic Paleontologists and Mineralogists, Houston, Texas, p. 8-93. Embayment: Oil and Gas Journal, v. 76, no. 4, p. 80-84. Florida: Cushman Foundation for Foraminiferal Research, Contributions, v. 15, pt. 2, p. 45-72. Applin, P. L., 1951, Preliminary report on buried pre-Mesozoic rocks in Florida and adjacent states: U.S.
Geological Survey Circular 91, 28 p.
Survey Report of Investigation no. 97, 39 p.
Societies, v. 23, p. 355-363.
of Geological Societies Transactions, v. 25, p. 122-142. Geological Survey Map Series 119, Scale: 30 miles to 1 inch. Resources Special Report 81-1, 38 p.
1929, Geology of Florida: Florida Geological Survey 20th Annual Report, 103 p.). Florida Geological Survey Map Series 52. Florida Geological Survey Bulletin 45, 105 p.
Transactions of the Gulf Coast Association of Geological Societies, v. 29, p. 238- 243. Survey Bulletin 16, 25 p.
Cooke, C. W., 1945, Geology of Florida: Florida Geological Survey, Bulletin 29, 339 p.
of America Proceedings for 1935, p. 71-72.
evidence: Journal of Geophysical Research, v. 76, p. 4754-4757. Paleontology, v. 47, p. 279-288. Crider, A. F., 1906, Geology and mineral resources of Mississippi: U.S. Geological Survey Bulletin No. 283, in: U.S. House of Representatives, House Documents, v. 76, doc. no. 831, p. 3- 99.
of western Europe, with annotations: U.S. Geological Survey 18th Annual Report, Part II, p. 344. Society of America Bulletin, v. 5, p. 147-170. Finch, J., 1823, Geological essay on the Tertiary Formation in America: American Journal of Science, v.
Professional Paper 142, parts 1-4, p. 1-185. Healy, H. G., 1975, Terraces and shorelines: Florida Bureau of Geology Map Series 71. Society of America Section Meeting, v. 8, n. 2, p. 20. Florida State University, Tallahassee, 210 p..
Johnson, L. C., 1888, The structure of Florida: American Journal of Science, v. 36, p. 230-236. Jordan, L., 1954, Oil possibilities in Florida: Oil and Gas Journal, v. 53, p. 370-375. Langdon, D. W., Jr., 1889, Some Florida Miocene: American Journal of Science, v. 38, p. 322-323. Survey 19th Annual Report, 1926-1927, p. 144-146.
ence to the stratigraphy: Florida Geological Survey 2nd Annual Report, p. 25-173. Geological Survey Report of Investigations 41, 51 p.
Geological Survey Report of Investigations 57, 127 p.
Geological Society of America Abstracts with Programs, v. 8, p. 237-238.
rocks from the subsurface of Florida: Geology, v. 15, p. 900-903. Supply Paper 1255, 965 p..
Series 70, scale: approximately 30 miles to one inch. Geologists Bulletin, v. 31, p. 1851-1862. Survey Bulletin 36, 345 p.
exposures: Florida Geological Survey Special Publication 5 (revised), 312 p.
Geological Survey Bulletin 31 (revised), 461 p..
Florida Geological Survey Bulletin 58, 146 p.. 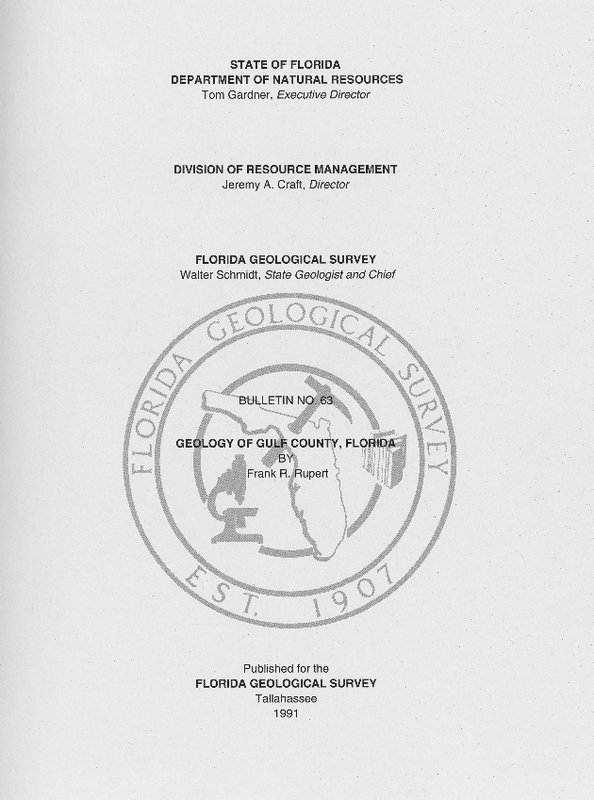 Proceedings of the symposium, p. 224-234.
of the Apalachicola coast, Florida: Geological Society of America Special Paper 112, 72 p.
Survey Bulletin 59, 148 p.
work, Introduction and hydrogeologic framework: Florida Geological Survey Special Publication. in: Florida Geological Survey 11th Annual Report, p. 77.
area: Transactions Gulf Coast Association of Geological Societies, v. 26, p. 258- 278. Smith, D. L., 1982, Review of the tectonic history of the Florida basement: Tectonophysics, v. 88, p. 1-22. Florida Bureau of Economic and Business Research, Population Studies, v. 22, no. 2, p. 5. Geological Survey Special Publication 28, 8 p.
Petrology, v. 43, p. 396-407. Florida: [Ph.D. dissertation] Florida State University, Tallahassee, 221 p.
University Print Shop, p. 200-201. Georgia: Georgia Geological Survey Bulletin 26, 466 p.
1951, Geology of Citrus and Levy Counties, Florida: Florida Geological Survey Bulletin no. County, Florida, Canal: [M.S. thesis] Florida State University, 119 p.
District: Northwest Florida Water Management District Public Information Bulletin 88-1, 24 p..
Wilson, J. T., 1966, Did the Atlantic close and then reopen? : Nature, v. 211, p. 676-681. Gulf and Franklin Counties, Florida: [M.S. thesis] Florida State University, Tallahassee, 133 p.
Jon Arthur, Petrologist Nancy LaPlace, Research Asst. Paulette Bond,Geochemist Milena Macesich, Research Asst. Ken Campbell, Sedimentologist Ted Maul, Research Asst. Cindy Collier, Secretary Mel Martinez, Research Asst. Joel Duncan, Sed. Petrologist Bruce Nocita, Research Assoc. Rick Green, Research Asst. Larry Papetti, Research Asst. Jim Jones, Cartographer Frank Rush, Lab Tech. Clay Kelly, Research Asst. Tom Seal, Research Asst. Ted Kiper, Cartographer Ron White, Research Asst. Don Hargrove, Engineer Koren Taylor, Research Asst.